Due to the high rate of recurrence, adjuvant therapy has been suggested following surgery. However, the long-term impact of adjuvant radiation therapy has proven to be inconclusive.6–8 The high incidence of systemic recurrence after surgery and radiation has led to the notion that metastasis may occur early in the course of pancreatic tumorogenesis.9 For this reason, the treatment of pancreatic cancer has most recently focused on multimodality treatment with surgery, chemotherapy, and radiation. Gemcitabine and erlotinib are the only two agents approved for use in advanced disease, but both have only a modest benefit. Gemcitabine was shown to prolong survival of patients by 5.6 months compared to 4.4 months with 5-fluorouracil.10 The addition of erlotinib to gemcitabine saw a miniscule increase of median survival from 5.9 to 6.2 months.11 Thus, development of targeted agents and chemotherapies over the last five decades has only modestly affected clinical outcome and not changed 5-year survival. Fortunately, the genetic and molecular mechanisms underlying pancreatic cancer are being rapidly uncovered and are providing opportunities for novel targeted therapies. Oncolytic viral therapy is of the most promising targeted agents for pancreatic cancer. This review will look at the current state of the development of these self-replicating nanoparticles in the treatment of pancreatic cancer. Due to its tumor selectivity and ability to cause cancer cell lysis, oncolytic virotherapy is becoming increasingly popular for the treatment of many different forms of cancer. Oncolytic viruses selectively target tumor cells through engineered mutations that prevent the binding to and replication of virus in normal cells and by expressing foreign genes that cause cell death both directly and/or indirectly.12 These viruses are also usually replication competent. Thus, replication in tumor cells generates infectious progeny that may further spread through and kill the tumor mass.13 The efficacy of oncolytic viruses depends upon the direct tumor lysis, the ability of the virus to spread to surrounding cancer cells, and the virus’s ability to direct an immune response to the tumor. Optimal oncolytic viruses need to be extremely selective in the cells that they infect and replicate in. 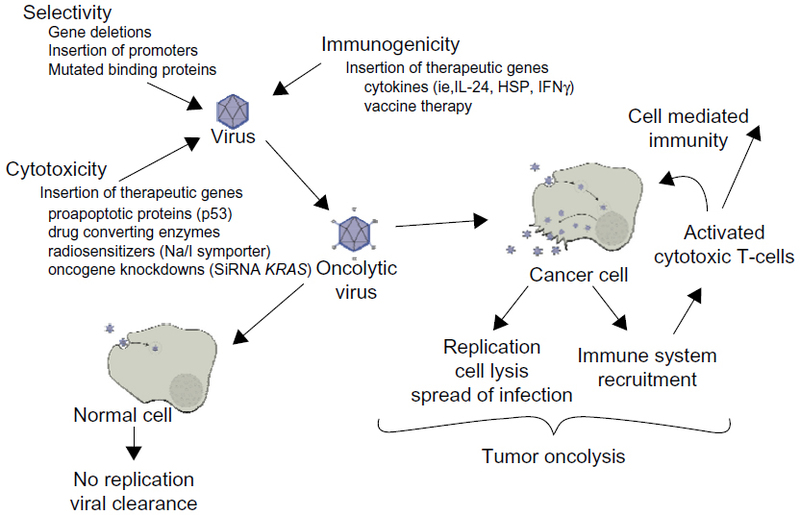 There are a number of ways in which their selectivity is improved: 1) by deleting viral genes that are required for replication in normal cells but are unnecessary in cancer cells; 2) by transcriptional targeting, where viral replication is controlled by tissue specific promoters; and/or 3) transductional targeting, where the virus is retargeted specifically to tumor cells. One of the important advantages oncolytic viruses have over other cancer therapies is the great potential to genetically manipulate the candidate virus to assume greater potency against a specific cancer. These manipulations help both to increase the potency of viral therapy against a tumor and to abrogate the adverse effects of cancer therapy (Figure 1). Figure 1 Oncolytic viral therapy. Abbreviations: HSP, heat shock proteins; IFN, interferon; IL, interleukin; SiRNA, short interfering RNA. The microbiology of pancreatic cancer provides unique challenges in designing and implementing effective oncolytic vectors and gene therapy. Oncogenic transformation in the pancreas is currently understood to be a multistage process that involves the accumulation of inherited and acquired mutations of specific cancer-associated genes in preneoplastic lesions. The literature describes three types of pancreatic ductal adenocarcinoma (PDAC) precursor lesions: pancreatic intraepithelial neoplasia, intraductal papillary neoplasia, and mucinous cystic neoplasms. They all follow a multistep progression from preneoplastic to invasive cancer, characterized by increasing degrees of morphological and cytological atypia.14,15 Most commonly this starts with an activating mutation in the KRAS gene, which is then followed by a somatic mutation in one or more of the tumor suppressor genes TP53, p16/CDKN2A, and SMAD4.16 Approximately 10% of cases can be partially ascribed to one of several germline mutations including BRCA2, STK11/LKB1, or p16/CDKN2A.17 This model for the stepwise development of PDAC has been supported in animal models by genetically engineered mice with a single point mutation in the KRAS oncogene. These mice were found to develop pancreatic preneoplastic lesions similar to those found in humans.18 Progression to metastatic carcinoma required both the KRAS mutation and the loss of a tumor suppressor gene.18–20 Researchers have found a total of 12 core signaling pathways that are commonly dysregulated in PDAC, of which KRAS, TP53, p16/CDKN2A, and SMAD4 are found in two thirds of tumors studied.21 Targeting of these molecular pathways is just one of the ways that oncolytic viruses and targeted therapies are being tailored to pancreatic cancer (Table 1). Abbreviations: GTP, guanosine triphosphate; TGF-β, transforming growth factor type beta. The high resistance to conventional and targeted therapies in PDAC may in part be explained by the diverse influences that are being exerted by the pancreatic microenviroment on the cancer cells. The dense extracellular matrix in pancreatic cancer distorts the normal architecture of the tissue and causes an abnormal configuration of blood and lymphatic vessels, resulting in a hypoxic tumor mass, which is one reason why many systemically delivered therapies, such as systemic chemotherapy and viral therapy work poorly in pancreatic cancer.22 In fact, many strategies are being studied that target the stromal matrix in an effort to increase the effect of systemic therapies. Inhibition of hedgehog signaling, which is involved in desmoplasia, has been shown to increase the penetration of gemcitabine into pancreatic xenografts. Also, the use of hyaluronidase to enzymatically remodel the stromal matrix has shown an increase in the delivery of systemic therapies to the tumor tissue. Initial preclinical success with these therapies suggests that the dense extracellular matrix in pancreatic cancer is partly responsible for the innate chemoresistance of pancreatic tumors, by creating barriers that protect tumor cells from systemically circulating therapeutic compounds.23–26 The tumor extracellular matrix is only one potential target to improve systemic and molecular therapies. Inflammation is an important factor in the development of PDAC. Some studies suggest that over 50% of the tumor mass is made up of inflammatory cells and numerous studies point to long-term inflammation of the pancreas as a driving force in the development of PDAC.30,31 The PDAC tumor microenvironment is significantly pro-tumorigenic, with the majority of the cells being made up of immunosuppressive cells such as regulatory T-cells and myeloid-derived suppressor cells.30 Successful immunotherapy requires cytotoxic T-cells to have high affinity for cancer cell antigens without causing autoimmunity. Unfortunately, cytotoxic T-cells make up a significant minority of the immune cells in the tumor, severely restricting the immunogenicity that results from infection with oncolytic viruses, suggesting that virus augmented with cytokines that are systemically or locally delivered to increase the immune response would be beneficial. The microenvironment of pancreatic cancer makes it difficult for systemic therapies to access cancer cells. Breaching this stromal barrier is a promising strategy to improve the delivery and efficacy of cytotoxic drugs and oncolytic vectors. Significant therapeutic benefit could be obtained by using strategies that aim to deplete the desmoplastic stroma, activate the immune system to target tumor cells, and target cells that increase the metastatic potential of PDAC. One of the most commonly used viral vectors being designed for treatment of cancer is the adenovirus. Gendicine and Oncorine are two adenoviruses that are currently approved for the treatment of cancer in China.38 Adenoviruses are double-stranded DNA viruses that are encompassed by an icosahedral protein capsid. When they come in contact with a cell, the virus binds to a receptor on a cell with high affinity.39 Once inside the cell, the virion moves to the nuclear pore complex, where its genome is released into the nucleoplasm and gene expression and genome replication occur. In a final step, the progeny viruses are released by disintegration of the cell membrane and infection of neighboring tumor cells occurs. Abbreviations: Ad3, adenovirus type 3; Ad5, adenovirus type 5; ADP, adenosine diphosphate; BCL-2, B-cell lymphoma 2; CEA, carcinoembryonic antigen; GLi1, family zinc finger 1; HSV, herpes simplex virus; IFN, interferon; IL, interleukin; pRb, retinoblastoma protein; SiRNA, short interfering RNA. Oncorine is another virus in clinical use that has a deletion of the E1B gene and a partial deletion of the E3 gene. It has been approved for the treatment of head and neck cancers in China and has been shown to be well-tolerated and have good efficacy when combined with or without chemotherapy.38,40 It is currently in clinical trial in the United States for pancreatic cancer. Deletion or mutation of multiple genes further improves selectivity of virus for cancer and prevents reversion to wild type. When both the E1A gene and the E1B 19 kDa gene are deleted there is a significant increase in tumor selectivity. Importantly, the potency of the virus was retained when compared to the wild type adenovirus without any gene deletions. Efficacy of the virus was shown to further increase when it was in combination with gemcitabine and other chemotherapies.44,45 Importantly, these studies show that oncolytic viruses can be engineered to be selective while still retaining their potency. The second way that adenoviruses have been engineered to improve selectivity in pancreatic cancer is by placing important proteins behind tumor-specific promoters. At least five tumor specific promoters have been used to construct targeted adenoviruses for pancreatic cancer therapy. The promoters used have been cyclooxygenase-2 promoter, urokinase-type plasminogen activator receptor promoter, telomerase reverse transcriptase promoter, hypoxia-responsive promoter, KRAS promoter, and human carcinoembryonic antigen promoter.46–54 The promoters have been shown to increase the selectivity of the virus without negatively impacting the infectivity. The herpes simplex viruses (HSV) HSV-1 and HSV-2 are large enveloped viruses with double-stranded DNA. In the wild they cause self-limiting infection, often causing sores in the mouth, lips, or genitalia, and can establish latent infection in the neural ganglia. As an oncolytic virus, HSV has been genetically modified to replicate only in cancer cells and has demonstrated itself as a promising agent in the virotherapy of pancreatic cancer. Compared to other oncolytic viruses, HSV has a number of distinct advantages and disadvantages. The genome is large compared to other viruses, with many nonessential genes that can be mutated and replaced with therapeutic genes. Several anti-HSV medications are available (acyclovir, ganciclovir) for the treatment of patients with adverse reactions to virotherapy. HSV does not integrate itself into the cellular DNA, thus reducing the risk of foreign genes being inserted into the patient’s DNA. Compared to other families of viruses, HSV is known to infect and kill tumor cells more quickly. The hope is that this will prevent the immune system from restricting the spread of the virus prior to tumor oncolysis. HSV has the ability to infect many different cancer cell types, making it a viable candidate for many different forms of cancer.59 Finally, HSV exhibits strong T-cell-mediated tumor reactivity, and can indirectly cause an immune response to cancer and tumor regression from cytotoxic T-cells- and natural killer (NK) cells-mediated mechanism. This likely plays an essential role in the antitumor abilities of HSV. There are a number of different HSV oncolytic viruses that have been studied in pancreatic cancer (Table 3). They use two major strategies to engineer selectivity for cancer cells: 1) the deletion of essential viral genes for replication (ie, γ34.5 gene); and 2) deletion of genes that regulate the protein kinase response (PKR) pathway (ie, ICP6 gene). A number of HSV-based oncolytic viruses have produced encouraging results in preclinical and clinical studies. Abbreviations: GM–CSF, granulocyte–macrophage colony-stimulating factor; HSV, herpes simplex virus. GLV-1h68 is a replication-competent virus with attenuation mutations in F14.5L, J2R (encodes thymidine kinase), and A56R (encodes hemagglutinin). It has been reported to infect, replicate, and lyse pancreatic cancer cells both in vivo and in vitro. Importantly though, when combined with gemcitabine or cisplatin, the tumors showed enhanced and accelerated therapeutic effects. With the current treatment modalities of surgery, chemotherapy, and radiotherapy, the prognosis of pancreatic cancer remains poor. The microenvironment of pancreatic cancer presents many unique challenges that will need to be overcome if we are going to successfully treat pancreatic cancer. Fortuitously, there are a number of different oncolytic viruses that have been shown to have real value in the treatment of pancreatic cancer in preclinical animal models. Clinical trials of oncolytic viruses have shown that oncolytic virotherapy is both a safe and feasible option for pancreatic cancer treatment in humans. However, there is still a great deal of opportunity for optimizing oncolytic viruses in the treatment of pancreatic cancer. In the future, viruses targeted to disrupt EMT may help to reduce the population of cancer stem cells that are contributing to treatment resistance and tumor metastasis. Also, combining viruses with systemic therapies that aim to disrupt the desmoplastic matrix and allow better penetration of viral therapy into tumors should lead to more successful viral therapy. Stathis A, Moore MJ. Advanced pancreatic carcinoma: current treatment and future challenges. Nat Rev Clin Oncol. 2010;7(3):163–172. American Cancer Society. Cancer Facts and Figures 2013. Atlanta: American Cancer Society; 2013. Available from: http://www.cancer.org/acs/groups/content/@epidemiologysurveilance/documents/document/acspc-036845.pdf. Accessed August 1, 2013. Bilimoria KY, Bentrem DJ, Ko CY, et al. Validation of the 6th edition AJCC Pancreatic Cancer Staging System: report from the National Cancer Database. Cancer. 2007;110(4):738–744. Allison DC, Piantadosi S, Hruban RH, et al. DNA content and other factors associated with ten-year survival after resection of pancreatic carcinoma. J Surg Oncol. 1998;67(3):151–159. Neoptolemos JP, Stocken DD, Bassi C, et al; European Study Group for Pancreatic Cancer. Adjuvant chemotherapy with fluorouracil plus folinic acid vs gemcitabine following pancreatic cancer resection: a randomized controlled trial. JAMA. 2010;304(10):1073–1081. Zygogianni GA, Kyrgias G, Kouvaris J, et al. Intraoperative radiation therapy on pancreatic cancer patients: a review of the literature. Minerva Chir. 2011;66(4):361–369. Ruano-Ravina A, Almazán Ortega R, Guedea F. Intraoperative radiotherapy in pancreatic cancer: a systematic review. Radiother Oncol. 2008;87(3):318–325. Moore MJ, Goldstein D, Hamm J, et al; National Cancer Institute of Canada Clinical Trials Group. Erlotinib plus gemcitabine compared with gemcitabine alone in patients with advanced pancreatic cancer: a phase III trial of the National Cancer Institute of Canada Clinical Trials Group. J Clin Oncol. 2007;25(15):1960–1966. Vacchelli E, Eggermont A, Sautès-Fridman C, et al. Trial watch: Oncolytic viruses for cancer therapy. Oncoimmunology. 2013;2(6):e24612. Zeyaullah M, Patro M, Ahmad I, et al. Oncolytic viruses in the treatment of cancer: a review of current strategies. Pathol Oncol Res. 2012;18(4):771–781. Koorstra JB, Hustinx SR, Offerhaus GJ, Maitra A. Pancreatic carcinogenesis. Pancreatology. 2008;8(2):110–125. Gnoni A, Licchetta A, Scarpa A, et al. Carcinogenesis of pancreatic adenocarcinoma: precursor lesions. Int J Mol Sci. 2013;14(10):19731–19762. Iacobuzio-Donahue CA, Velculescu VE, Wolfgang CL, Hruban RH. Genetic basis of pancreas cancer development and progression: insights from whole-exome and whole-genome sequencing. Clin Cancer Res. 2012;18(16):4257–4265. Lowenfels AB, Maisonneuve P. Epidemiology and risk factors for pancreatic cancer. Best Pract Res Clin Gastroenterol. 2006;20(2):197–209. Grippo PJ, Nowlin PS, Demeure MJ, Longnecker DS, Sandgren EP. Preinvasive pancreatic neoplasia of ductal phenotype induced by acinar cell targeting of mutant Kras in transgenic mice. Cancer Res. 2003;63(9):2016–2019. Aguirre AJ, Bardeesy N, Sinha M, et al. Activated Kras and Ink4a/Arf deficiency cooperate to produce metastatic pancreatic ductal adenocarcinoma. Genes Dev. 2003;17(24):3112–3126. Bardeesy N, Aguirre AJ, Chu GC, et al. Both p16(Ink4a) and the p19(Arf)-p53 pathway constrain progression of pancreatic adenocarcinoma in the mouse. Proc Natl Acad Sci U S A. 2006;103(15):5947–5952. Feig C, Gopinathan A, Neesse A, Chan DS, Cook N, Tuveson DA. The pancreas cancer microenvironment. Clin Cancer Res. 2012;18(16):4266–4276. Erkan M, Adler G, Apte MV, et al. StellaTUM: current consensus and discussion on pancreatic stellate cell research. Gut. 2012;61(2):172–178. Vonlaufen A, Joshi S, Qu C, et al. Pancreatic stellate cells: partners in crime with pancreatic cancer cells. Cancer Res. 2008;68(7):2085–2093. Lonardo E, Frias-Aldeguer J, Hermann PC, Heeschen C. Pancreatic stellate cells form a niche for cancer stem cells and promote their self-renewal and invasiveness. Cell Cycle. 2012;11(7):1282–1290. Momi N, Kaur S, Krishn SR, Batra SK. Discovering the route from inflammation to pancreatic cancer. Minerva Gastroenterol Dietol. 2012;58(4):283–297. Shah AN, Summy JM, Zhang J, Park SI, Parikh NU, Gallick GE. Development and characterization of gemcitabine-resistant pancreatic tumor cells. Ann Surg Oncol. 2007;14(12):3629–3637. Wang Z, Li Y, Kong D, et al. Acquisition of epithelial-mesenchymal transition phenotype of gemcitabine-resistant pancreatic cancer cells is linked with activation of the notch signaling pathway. Cancer Res. 2009;69(6):2400–2407. Yang AD, Camp ER, Fan F, et al. Vascular endothelial growth factor receptor-1 activation mediates epithelial to mesenchymal transition in human pancreatic carcinoma cells. Cancer Res. 2006;66(1):46–51. Yang AD, Fan F, Camp ER, et al. Chronic oxaliplatin resistance induces epithelial-to-mesenchymal transition in colorectal cancer cell lines. Clin Cancer Res. 2006;12(14 Pt 1):4147–4153. Buck E, Eyzaguirre A, Barr S, et al. Loss of homotypic cell adhesion by epithelial-mesenchymal transition or mutation limits sensitivity to epidermal growth factor receptor inhibition. Mol Cancer Ther. 2007;6(2):532–541. Garber K. China approves world’s first oncolytic virus therapy for cancer treatment. J Natl Cancer Inst. 2006;98(5):298–300. Cerullo V, Koski A, Vähä-Koskela M, Hemminki A. Chapter eight – Oncolytic adenoviruses for cancer immunotherapy: data from mice, hamsters, and humans. Adv Cancer Res. 2012;115:265–318. Hecht JR, Bedford R, Abbruzzese JL, et al. A phase I/II trial of intratumoral endoscopic ultrasound injection of ONYX-015 with intravenous gemcitabine in unresectable pancreatic carcinoma. Clin Cancer Res. 2003;9(2):555–561. Bischoff JR, Kirn DH, Williams A, et al. An adenovirus mutant that replicates selectively in p53-deficient human tumor cells. Science. 1996;274(5286):373–376. Heise C, Sampson-Johannes A, Williams A, McCormick F, Von Hoff DD, Kirn DH. ONYX-015, an E1B gene-attenuated adenovirus, causes tumor-specific cytolysis and antitumoral efficacy that can be augmented by standard chemotherapeutic agents. Nat Med. 1997;3(6):639–645. Heise C, Hermiston T, Johnson L, et al. An adenovirus E1A mutant that demonstrates potent and selective systemic anti-tumoral efficacy. Nat Med. 2000;6(10):1134–1139. Oberg D, Yanover E, Adam V, et al. Improved potency and selectivity of an oncolytic E1ACR2 and E1B19K deleted adenoviral mutant in prostate and pancreatic cancers. Clin Cancer Res. 2010;16(2):541–553. Cherubini G, Kallin C, Mozetic A, et al. The oncolytic adenovirus AdΔΔ enhances selective cancer cell killing in combination with DNA-damaging drugs in pancreatic cancer models. Gene Ther. 2011;18(12):1157–1165. Xu C, Sun Y, Wang Y, et al. CEA promoter-regulated oncolytic adenovirus-mediated Hsp70 expression in immune gene therapy for pancreatic cancer. Cancer Lett. 2012;319(2):154–163. Mihaljevic AL, Michalski CW, Friess H, Kleeff J. Molecular mechanism of pancreatic cancer – understanding proliferation, invasion, and metastasis. Langenbecks Arch Surg. 2010;395(4):295–308. Bortolanza S, Bunuales M, Otano I, et al. Treatment of pancreatic cancer with an oncolytic adenovirus expressing interleukin-12 in Syrian hamsters. Mol Ther. 2009;17(4):614–622. Hu Y, Ou Y, Wu K, Chen Y, Sun W. miR-143 inhibits the metastasis of pancreatic cancer and an associated signaling pathway. Tumour Biol. 2012;33(6):1863–1870. Ramirez PJ, Vickers SM, Ono HA, et al. Optimization of conditionally replicative adenovirus for pancreatic cancer and its evaluation in an orthotopic murine xenograft model. Am J Surg. 2008;195(4):481–490. Nelson AR, Davydova J, Curiel DT, Yamamoto M. Combination of conditionally replicative adenovirus and standard chemotherapies shows synergistic antitumor effect in pancreatic cancer. Cancer Sci. 2009;100(11):2181–2187. Huch M, Gros A, José A, González JR, Alemany R, Fillat C. Urokinase-type plasminogen activator receptor transcriptionally controlled adenoviruses eradicate pancreatic tumors and liver metastasis in mouse models. Neoplasia. 2009;11(6):518–528. Onimaru M, Ohuchida K, Nagai E, et al. Combination with low-dose gemcitabine and hTERT-promoter-dependent conditionally replicative adenovirus enhances cytotoxicity through their crosstalk mechanisms in pancreatic cancer. Cancer Lett. 2010;294(2):178–186. Onimaru M, Ohuchida K, Mizumoto K, et al. hTERT-promoter-dependent oncolytic adenovirus enhances the transduction and therapeutic efficacy of replication-defective adenovirus vectors in pancreatic cancer cells. Cancer Sci. 2010;101(3):735–742. Wang H, Li ZY, Liu Y, et al. Desmoglein 2 is a receptor for adenovirus serotypes 3, 7, 11 and 14. Nat Med. 2011;17(1):96–104. Chu QD, Sun G, Pope M, et al. Virotherapy using a novel chimeric oncolytic adenovirus prolongs survival in a human pancreatic cancer xenograft model. Surgery. 2012;152(3):441–448. He B, Huang X, Liu X, Xu B. Cancer targeting gene-viro-therapy for pancreatic cancer using oncolytic adenovirus ZD55-IL-24 in immune-competent mice. Mol Biol Rep. 2013;40(9):5397–5405. Abate-Daga D, Andreu N, Camacho-Sanchez J, et al. Oncolytic adenoviruses armed with thymidine kinase can be traced by PET imaging and show potent antitumoural effects by ganciclovir dosing. PloS One. 2011;6(10):e26142. Eisenberg DP, Carpenter SG, Adusumilli PS, et al. Hyperthermia potentiates oncolytic herpes viral killing of pancreatic cancer through a heat shock protein pathway. Surgery. 2010;148(2):325–334. Liu BL, Robinson M, Han ZQ, et al. ICP34.5 deleted herpes simplex virus with enhanced oncolytic, immune stimulating, and anti-tumour properties. Gene Ther. 2003;10(4):292–303. Varghese S, Rabkin SD, Nielsen GP, MacGarvey U, Liu R, Martuza RL. Systemic therapy of spontaneous prostate cancer in transgenic mice with oncolytic herpes simplex viruses. Cancer Res. 2007;67(19):9371–9379. Sarinella F, Calistri A, Sette P, Palù G, Parolin C. Oncolysis of pancreatic tumour cells by a g34.5- deleted HSV-1 does not rely upon Ras-activation, but on the PI 3-kinase pathway. Gene Ther. 2006;13(14):1080–1087. Kasuya H, Nishiyama Y, Nomoto S, Hosono J, Takeda S, Nakao A. Intraperitoneal delivery of hrR3 and ganciclovir prolongs survival in mice with disseminated pancreatic cancer. J Surg Oncol. 1999; 72(3):136–141. Watanabe I, Kasuya H, Nomura N, et al. Effects of tumor selective replication-competent herpes viruses in combination with gemcitabine on pancreatic cancer. Cancer Chemother Pharmacol. 2008;61(5):875–882. Kasuya H, Nishiyama Y, Nomoto S, et al. Suitability of a US3-inactivated HSV mutant (L1BR1) as an oncolytic virus for pancreatic cancer therapy. Cancer Gene Ther. 2007;14(6):533–542. Varghese S, Rabkin SD. Oncolytic herpes simplex virus vectors for cancer virotherapy. Cancer Gene Ther. 2002;9(12):967–978. Kanai R, Tomita H, Shinoda A, et al. Enhanced therapeutic efficacy of G207 for the treatment of glioma through Musashi1 promoter retargeting of gamma34.5-mediated virulence. Gene Ther. 2006;13(2):106–116. Dai MH, Zamarin D, Gao SP, et al. Synergistic action of oncolytic herpes simplex virus and radiotherapy in pancreatic cancer cell lines. Br J Surg. 2010;97(9):1385–1394. Fu X, Tao L, Li M, Fisher WE, Zhang X. Effective treatment of pancreatic cancer xenografts with a conditionally replicating virus derived from type 2 herpes simplex virus. Clin Cancer Res. 2006;12(10):3152–3157. Nawa A, Luo C, Zhang L, et al. Non-engineered, naturally oncolytic herpes simplex virus HSV1 HF-10: applications for cancer gene therapy. Curr Gene Ther. 2008;8(3):208–221. Nakao A, Kasuya H, Sahin TT, et al. A phase I dose-escalation clinical trial of intraoperative direct intratumoral injection of HF10 oncolytic virus in non-resectable patients with advanced pancreatic cancer. Cancer Gene Ther. 2011;18(3):167–175. Melcher A, Parato K, Rooney CM, Bell JC. Thunder and lightning: immunotherapy and oncolytic viruses collide. Mol Ther. 2011;19(6):1008–1016. Campadelli-Fiume G, De Giovanni C, Gatta V, Nanni P, Lollini PL, Menotti L. Rethinking herpes simplex virus: the way to oncolytic agents. Rev Med Virol. 2011;21(4):213–226. Hu JC, Coffin RS, Davis CJ, et al. A phase I study of OncoVEXGM-CSF, a second-generation oncolytic herpes simplex virus expressing granulocyte macrophage colony-stimulating factor. Clin Cancer Res. 2006;12(22):6737–6747. Harrington KJ, Hingorani M, Tanay MA, et al. Phase I/II study of oncolytic HSV GM-CSF in combination with radiotherapy and cisplatin in untreated stage III/IV squamous cell cancer of the head and neck. Clin Cancer Res. 2010;16(15):4005–4015. Pütz MM, Midgley CM, Law M, Smith GL. Quantification of antibody responses against multiple antigens of the two infectious forms of Vaccinia virus provides a benchmark for smallpox vaccination. Nat Med. 2006;12(11):1310–1315. Miller JD, van der Most RG, Akondy RS, et al. Human effector and memory CD8+ T cell responses to smallpox and yellow fever vaccines. Immunity. 2008;28(5):710–722. Kirn DH, Thorne SH. Targeted and armed oncolytic poxviruses: a novel multi-mechanistic therapeutic class for cancer. Nat Rev Cancer. 2009;9(1):64–71. Tysome JR, Briat A, Alusi G, et al. Lister strain of vaccinia virus armed with endostatin-angiostatin fusion gene as a novel therapeutic agent for human pancreatic cancer. Gene Ther. 2009;16(10):1223–1233. Ishizaki H, Manuel ER, Song GY, et al. Modified vaccinia Ankara expressing survivin combined with gemcitabine generates specific antitumor effects in a murine pancreatic carcinoma model. Cancer Immunol Immunother. 2011;60(1):99–109. Hiley CT, Yuan M, Lemoine NR, Wang Y. Lister strain vaccinia virus, a potential therapeutic vector targeting hypoxic tumours. Gene Ther. 2010;17(2):281–287. Wennier ST, Liu J, Li S, Rahman MM, Mona M, McFadden G. Myxoma virus sensitizes cancer cells to gemcitabine and is an effective oncolytic virotherapeutic in models of disseminated pancreatic cancer. Mol Ther. 2012;20(4):759–768. Woo Y, Kelly KJ, Stanford MM, et al. Myxoma virus is oncolytic for human pancreatic adenocarcinoma cells. Ann Surg Oncol. 2008;15(8):2329–2335. Petrulio CA, Kaufman HL. Development of the PANVAC-VF vaccine for pancreatic cancer. Expert Rev Vaccines. 2006;5(1):9–19. Kaufman HL, Kim-Schulze S, Manson K, et al. Poxvirus-based vaccine therapy for patients with advanced pancreatic cancer. J Transl Med. 2007;5:60. Tattersall P. The evolution of parvoviral taxonomy. In: Kerr JR, Cotmore S, Bloom ME, Linden RM, Parrish CR, editors. The Parvoviruses. London: Hodder Arnold; 2006:5–14. Rommelaere J, Geletneky K, Angelova AL, et al. Oncolytic parvoviruses as cancer therapeutics. Cytokine Growth Factor Rev. 2010;21(2–3):185–195. Grekova S, Aprahamian M, Giese N, et al. Immune cells participate in the oncosuppressive activity of parvovirus H-1PV and are activated as a result of their abortive infection with this agent. Cancer Biol Ther. 2010;10(12):1280–1289. Angelova AL, Aprahamian M, Grekova SP, et al. Improvement of gemcitabine-based therapy of pancreatic carcinoma by means of oncolytic parvovirus H-1PV. Clin Cancer Res. 2009;15(2):511–519. Bhat R, Dempe S, Dinsart C, Rommelaere J. Enhancement of NK cell antitumor responses using an oncolytic parvovirus. Int J Cancer. 2011;128(4):908–919. Dempe S, Lavie M, Struyf S, et al. Antitumoral activity of parvovirus-mediated IL-2 and MCP-3/CCL7 delivery into human pancreatic cancer: implication of leucocyte recruitment. Cancer Immunol Immunother. 2012;61(11):2113–2123. Galanis E. Therapeutic potential of oncolytic measles virus: promises and challenges. Clin Pharmacol Ther. 2010;88(5):620–625. Penheiter AR, Wegman TR, Classic KL, et al. Sodium iodide symporter (NIS)-mediated radiovirotherapy for pancreatic cancer. AJR Am J Roentgenol. 2010;195(2):341–349. Penheiter AR, Dingli D, Bender CE, Russell SJ, Carlson SK. Monitoring the initial delivery of an oncolytic measles virus encoding the human sodium iodide symporter to solid tumors using contrast-enhanced computed tomography. J Gene Med. 2012;14(9–10):590–597. Carlson SK, Classic KL, Hadac EM, et al. Quantitative molecular imaging of viral therapy for pancreatic cancer using an engineered measles virus expressing the sodium-iodide symporter reporter gene. AJR Am J Roentgenol. 2009;192(1):279–287. Bossow S, Grossardt C, Temme A, et al. Armed and targeted measles virus for chemovirotherapy of pancreatic cancer. Cancer Gene Ther. 2011;18(8):598–608. Himeno Y, Etoh T, Matsumoto T, Ohta M, Nishizono A, Kitano S. Efficacy of oncolytic reovirus against liver metastasis from pancreatic cancer in immunocompetent models. Int J Oncol. 2005;27(4):901–906. Etoh T, Himeno Y, Matsumoto T, et al. Oncolytic viral therapy for human pancreatic cancer cells by reovirus. Clin Cancer Res. 2003;9(3):1218–1223. Maitra R, Ghalib MH, Goel S. Reovirus: a targeted therapeutic – progress and potential. Mol Cancer Res. 2012;10(12):1514–1525. Morris DG, Feng X, DiFrancesco LM, et al. REO-001: A phase I trial of percutaneous intralesional administration of reovirus type 3 dearing (Reolysin®) in patients with advanced solid tumors. Invest New Drugs. 2013;31(3):696–706. Fueyo J, Gomez-Manzano C, Alemany R, et al. A mutant oncolytic adenovirus targeting the Rb pathway produces anti-glioma effect in vivo. Oncogene. 2000;19(1):2–12. Rocha-Lima CM, Raez LE. Erlotinib (tarceva) for the treatment of non-small-cell lung cancer and pancreatic cancer. P T. 2009;34(10):554–564. Armstrong L, Arrington A, Han J, et al. Generation of a novel, cyclooxygenase-2-targeted, interferon-expressing, conditionally replicative adenovirus for pancreatic cancer therapy. Am J Surg. 2012;204(5):741–750. Shan YF, Fang YF, Wang XQ, Jin R, Zhang QY, Andersson R. Experimental studies on treatment of pancreatic cancer with double-regulated duplicative adenovirus AdTPHre-hEndo carrying human endostatin gene. Pancreatology. 2013;13(4):393–400. Lisiansky V, Naumov I, Shapira S, et al. 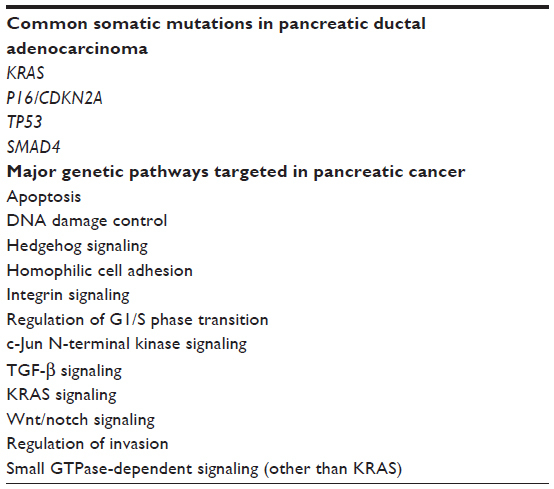 Gene therapy of pancreatic cancer targeting the KRas oncogene. Cancer Gene Ther. 2012;19(12):862–869. Xie FJ, Zhao P, Zhang YP, et al. Adenovirus-mediated interferon-gamma gene therapy induced human pancreatic carcinoma Capan-2 cell apoptosis in vitro and in vivo. Anat Rec (Hoboken). 2013;296(4):604–610. Guo J, Gao J, Li Z, et al. Adenovirus vector-mediated Gli1 siRNA induces growth inhibition and apoptosis in human pancreatic cancer with Smo-dependent or Smo-independent Hh pathway activation in vitro and in vivo. Cancer Lett. 2013;339(2):185–194. Zhang YA, Nemunaitis J, Samuel SK, Chen P, Shen Y, Tong AW. Antitumor activity of an oncolytic adenovirus-delivered oncogene small interfering RNA. Cancer Res. 2006;66(19):9736–9743. Freytag SO, Barton KN, Brown SL, et al. Replication-competent adenovirus-mediated suicide gene therapy with radiation in a preclinical model of pancreatic cancer. Mol Ther. 2007;15(9):1600–1606. Wang H, Pei W, Luan Q, et al. A feasibility study on gene therapy of pancreatic carcinoma with Ad-PUMA. Cancer Biol Ther. 2012;13(9):712–719. Lupu-Meiri M, Geras-Raaka E, Lupu R, et al. Knock-down of plasminogen-activator inhibitor-1 enhances expression of E-cadherin and promotes epithelial differentiation of human pancreatic adenocarcinoma cells. J Cell Physiol. 2012;227(11):3621–3628. Yoon SS, Carroll NM, Chiocca EA, Tanabe KK. Cancer gene therapy using a replication-competent herpes simplex virus type 1 vector. Ann Surg. 1998;228(3):366–374. He B, Gross M, Roizman B. The gamma(1)34.5 protein of herpes simplex virus 1 complexes with protein phosphatase 1alpha to dephosphorylate the alpha subunit of the eukaryotic translation initiation factor 2 and preclude the shutoff of protein synthesis by double-stranded RNA-activated protein kinase. Proc Natl Acad Sci U S A. 1997;94(3):843–848. Mineta T, Rabkin SD, Yazaki T, Hunter WD, Martuza RL. Attenuated multi-mutated herpes simplex virus-1 for the treatment of malignant gliomas. Nat Med. 1995;1(9):938–943. Meignier B, Longnecker R, Roizman B. In vivo behavior of genetically engineered herpes simplex viruses R7017 and R7020: construction and evaluation in rodents. J Infect Dis. 1988;158(3):602–614. Kimata H, Takakuwa H, Goshima F, et al. Effective treatment of disseminated peritoneal colon cancer with new replication-competent herpes simplex viruses. Hepatogastroenterology. 2003;50(52):961–966.